Yes, there are only 5 more sleeps to go! The Wellington launch for Riders of Fire, is this Saturday 17 November. The New Zealand paperback editions of Ezaara and Dragon Hero will be winging their way home with happy readers! But that’s not all. The Riders of Fire launch is going to be great fun. Kicking off with archery with John Turner, the afternoon includes prizes for best archer and swordsperson, sword fighting demonstrations from Company of the Dragons, a costume parade, and readings from Ezaara and Dragon Hero, the first two books in the Riders of Fire series. It’s cosplay time! So, come as a dragon, a fighter, or anything you like! You’ll also get a chance to duel with the pros! (Foam swords provided). There might even be real swords (blunted) on display. There will also be crafts for those who’d like to create their own dragon. A variety of costumes will be available for use on the day, as well books for children and young adults. You can even take selfies in front of a castle with a dragon! In the lead up to the launch over the next 5 days, I’ll be showcasing Dragons’ Realm, the world of the Riders of Fire Series. So, I’m sharing snippets of the map created by talented Ava Fairhall, who will also be there on the day, should you have any questions about creating your own fantasy world. Here are some of the snippets I’ve posted on Facebook already. When Ezaara imprints with Zaarusha, the Dragon Queen of Dragon’s Realm, she’s swept up in a blaze of emotion, and must abandon her home, family and everything she knows. Zaarusha sweeps her off to Dragons’ Hold, the home of tough dragon masters and riders, where she’s tested as the new Queens’ Rider. Luckily, she’s assigned a dragon master to help her. Although rumors say she’d be better off with the enemy than Master Roberto. Roberto grew up in the deep South in Naobia, where his father, Amato was captain of the green guards, the dragons who protect the southern borders of Dragons’ Realm. But Amato hid the darkest of secrets. Broken by his father, Roberto flees to Dragons’ Hold with his sister Adelina. He works hard and becomes a dragon master, using the strange talents gained through his father’s treachery, but his legacy haunts him every day. One night, Ezaara, an untried, untrained and ignorant girl from Lush Valley, of all places, turns up, claiming to be the new Queen’s Rider. Not if Roberto can help it. He’s determined to find her weaknesses and cast her out to die in The Wastelands. But to do so, he has to use the very talents he hates. See you on Saturday! If you’d like an ebook as well, both ebooks, Ezaara and Dragon Hero, are still 99 cents until after the launch. Chatting with Sherri – dragons! Today, Sunday, at 3pm New Zealand time, or Saturday 7pm Californian time yesterday, I’ll be on air with Sherri Rabinowitz on her show on Chatting with Sherri, hosted at BlogTalk Radio. It like being a time-traveller, speaking on radio today and knowing that people in America will be hearing us yesterday! Yeah, we kiwis always laugh at the confusion that our timezone creates in the rest of the world! Luckily, when you visit Sherri’s site, your local time shows so you’ll know when to tune in. Pop over and try it! 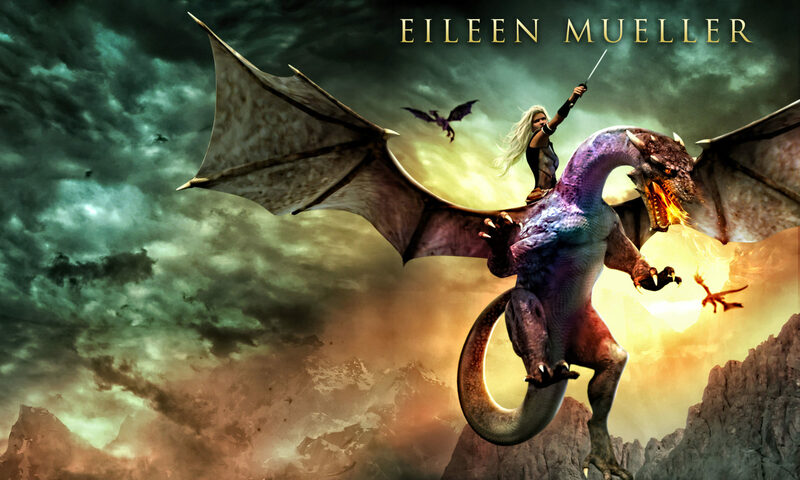 Sherri and I haven’t caught up for while, so we’ll be discussing all things dragons, including Ezaara and Dragon Hero, the new books in my young adult Riders of Fire Series, and why people like dragons. You may even discover the crazy hobby I had that inspired me to write about dragons, a hobby that took me to Switzerland, where I met Kurt. Enjoy the show and I’ll enjoy chatting with Sherri! When Ezaara meets Zaarusha the Dragon Queen, she’s swept up in a blaze of emotion and they imprint, forming a deep bond. But she must give up her home, her family and everything she knows to become the new Queen’s Rider. Ignorant and unprepared, how can she possibly succeed? Luckily, she has a dragon master — although rumors say that with help like his, maybe she’d be better off with the enemy. Plunged into a world of cutthroat politics and traitors in every shadow, who can Ezaara trust as Commander Zens and his army of bestial tharuks march closer, destroying villages and enslaving the people of Dragons’ Realm? What personal price must Ezaara and her Dragon Master pay to save their people? Do you love heart-pounding adventure, true love and dragons? Start your adventure today! Pre-order on Amazon, now, at a special price! The special price of 99 cents is only valid until 18 October 2018. Afterwards, Ezaara will be listed at $US 3.99. Click this link to start your dragon riding adventure! Then scroll down to get my free short story, Silver Dragon. Ezaara has been a long time coming. Nine years ago, I decided to write a book. When I began, the only thing I could see was the edge of a dragon’s multicolored wingtip. So I had to start asking questions. Who does the wingtip belong to? A dragon, Zaarusha, the Queen of Dragons’ Realm. Who is seeing the wingtip? A teenage girl, Ezaara, who isn’t even sure if dragons exist. In a clearing in a forest. She imprints with the dragon, forming a deep and everlasting bond. Ezaara is ripped out of her life in the sleepy backwater of Lush Valley, where it’s a crime to even talk about dragons, and plunged into a world of danger, deception and adventure. Why does the dragon choose her? Her mother has a dark and terrible secret that she’s hidden from Ezaara and her twin brother, Tomaaz. A secret that defines who they are. A secret that rips their family apart, throwing them into the jaws of malevolent enemies. A secret that spawns the series, Riders of Fire. Stay tuned, because I’ll be giving away a free short story, Silver Dragon. You can sign up to receive your copy here. Fans of Anne McCaffrey’s Dragon Riders of Pern and Christopher Paolini’s The Inheritance Cycle will love Riders of Fire. This story is brought to you compliments of the Summer Blog Hop. Feel free to visit the links at the bottom of this page and enjoy stories from many other authors. If you like Suds and Scales, there are more of my fun dragon stories for kids in Dragon Tales. I stomped into the bathroom and slammed the door. What was wrong with a bit of dirt? It was all natural, no additives and definitely no refined sugar – another thing Mom was always going on about. I was only going to get dirty again tomorrow. Peeling off my sweaty socks, I tucked them in the cabinet behind the shampoo, instead of in the hamper. Hopefully Mom wouldn’t sniff them out – I only had one pair of socks in my team’s color and I needed them for my football game tomorrow. Sighing, I turned on the faucet. I tipped some liquid soap into the bath. Soap was evil, but if I had to use it, I might as well have bubbles. When the water was deep and sudsy, I dumped my clothes on the floor and got in. Wrinkling my nose at the floral stench, I looked down. There were so many bubbles, I looked like a corpse-less ghost, or an alien with froth for a body. I turned so fast, a mini tsunami sloshed onto the floor. Nothing was there – except the clothes I’d dropped and the water I’d spilt. Nothing that could’ve made the toilet clunk. And now my underpants were swimming happily in the aftermath of my tidal wave. I lifted my right knee above the water and scrubbed it with the washcloth. I whirled back. Oops, another flood. Before my eyes, a long claw slid between the toilet seat and lid. My heart thudded, like I was running for goal. Two more claws reached over the edge. A scaly limb slithered out and flung the lid open with a crash. Another taloned limb grasped the seat. With a grunt, a dripping head emerged from the toilet! “Whoa!” I yelled, as a little dragon clambered out and perched on the seat. It was green with baby-blue eyes and had an odd crest sticking up on its head. Luckily I had lots of bubbles or that dragon would have seen too much. The dragon shook itself like a dog, spraying droplets everywhere. Dribbles splattered the mirror, ran down the walls, and landed on the towels. Yuck! Germy toilet water was all over the place. I eyed my towel on the rail. I’d have to remember to get myself a fresh one. “What are you doing?” the dragon’s voice was tiny. “Depends if you like roses.” I picked up a handful of bubbles and blew them over the floor. “I don’t know if I like roses.” The dragon leapt off the toilet, pouncing on the foam, its talons slithering across the slippery tiles. Its feet got tangled in my clothes, sending it tumbling. My undies flew up in the air and, as the little critter sat up, landed on its head. What a sight: baby-blue eyes peeping through the leg-hole of my dripping undies, its wee dragon body covered in soap suds. “That was fun,” the dragon said, and leapt into my bath, the undies floating away. “Aagh!” I jumped out, skidding on the floor, and landed in the mess. “No way, little guy. You’re dirty! You’ve been swimming in the grubby toilet.” I snatched my towel to cover my private parts, then realized, too late, that my towel was damp – with toilet water! Rummaging in the cupboard, I dropped the filthy towel and tugged a fresh one around me. “It means… never mind. You have fun in there for a few minutes.” I had to get the smelly toilet germs off me. I couldn’t get sick and let my team down tomorrow. Turning on the shower, I got in. Luckily the glass was frosted, so the dragon didn’t have a million-dollar view of me. I grabbed the soap and lathered it all over my body, scrubbing hard with a washcloth to make sure those germs were gone. Except the thunder cloud over my head. How dare that pesky dragon peep while I was showering? The lathered soap protected me from view, but I used the washcloth too, just in case. The dragon spied the shampoo bottle and bit it, squirting shampoo all over the shower walls. “Sorry,” it yelped, and flew out of the shower, diving into the bath . A huge plume of water shot up, splashing the floor. Not again. There was enough water out there for an Olympic swimming event. Even enough to wash a dirty football team. I scraped dribbles of pearly shampoo off the glass, collecting them in my palm. What a waste! Might as well use it. Mom would go nuts if all the shampoo was gone and I still had dirty hair. In the middle of working the shampoo into my hair, those baby-blue eyes peeped over the top of the glass again. “Sure, in a minute.” That little dragon needed a thorough scrub all over to get rid of those poo-ey germs. The dragon dive-bombed the bath, splashing the walls and soaking the other towels on the rail. “Are you using the shower and the bath at the same time?” Mom sounded way too curious. I breathed a sigh of relief as Mom’s footsteps went back down the hall. Drying myself, I pulled on clean underwear, shorts and a T-shirt from a hook on the back of the bathroom door. Luckily they were still dry. But not for long. The dragon’s next splash soaked me from head to foot – with its filthy bathwater. The baby dragon bared its fangs and tugged its lips up. It was smiling – the weirdest but cutest smile I’d ever seen. I pulled the plug out of the bath. The water – now an odd shade of brown – went down the drain with a huge slurp. The dragon froze on the edge of the bath, looking more like an ornate dragon fountain than an animal. I could imagine water spouting from its mouth at any moment. I ran more warm water into the bath. When I turned around, the dragon was balanced on the toilet seat, drinking water from the bowl. “Here, I’ll help you.” I grabbed my toothbrush and toothpaste and cleaned the dragon’s fangs. “You have to take care of your health,” I said. “You can’t just drink any old water.” I rolled my eyes – I sounded just like Mom. I turned off the bath faucet and, when I looked again, the dragon’s tail was curled around my toothbrush. It stamped on the toothpaste tube to squeeze out some more. I laughed, until it flew towards me, toothbrush still in its tail. Clamping my mouth shut, I turned my head away, so the dragon couldn’t brush my teeth with the grubby brush it had just used for its toilet-water-drinking teeth. “I’m fine, thanks. You can keep that brush. It’s a gift, just for you.” I grabbed a new brush out of the cabinet, hurriedly smeared it with what was left of the toothpaste, and brushed my teeth. The dragon brushed its fangs. Afterwards, I put my new brush safely in the cabinet, so it wouldn’t end up in the dragon’s clutches. Then I popped the dragon in the bath and soaped it well. I even shampooed its crest. I scrubbed the creature’s hide with a soft nail brush. It purred happily, turning a lighter shade of green. The water turned dark gray, not clean enough for rinsing. I used the wet towels to mop up the floor and walls, and rinsed the shampoo off the shower walls. Then I gathered all the sopping gear and dropped it into the bath with a satisfying squelch. The dragon flew out of the shower, rubbing its body against a freshly-hung towel, then flitted around the room. I tossed its towel into the bath, too. I was still damp, but the bathroom was cleaner than before. A deep rumble issued from the toilet. The dragon’s eyes shot wide open. “Ooh! That’s Mom calling me for dinner!” It perched on my shoulder and gave me a minty-toothpaste kiss! “I’ll be back tomorrow, so we can play again.” It grabbed my old toothbrush in its talons and dived into the toilet with a splash. I dashed over and peered into the bowl. There was nothing there. Mom was speechless, except for a quiet, “Wow.” She swept the towels and dirty laundry out of the bathtub. “Thanks,” she said, her eyebrows raised, as if she couldn’t believe her luck. “I’ll do the laundry right away.” She marched out, leaving a trail of drips behind her. Outside, thunder rumbled through the sky. Was that what I’d heard? Or had there really been a dragon growling in the toilet, a moment ago? Maybe I’d imagined it. Mom was always telling me I had an over-active imagination. As I left the bathroom, I picked up a washcloth Mom must’ve dropped. Something wet glinted against the fabric. I looked closer. It was a green scale. Call of the Sea has been nominated for the 2017 Sir Julius Vogel awards, however, to get on the shortlist, a story must be nominated multiple times. Call of the Sea, published in At the Edge (Paper Road Press 2016), is a dark story exploring grief, loss and hope. If you have read Call of the Sea and enjoyed it, please feel free to nominate it before 8pm Friday 31 March, on the SJV Awards nomination form. (Nomination info & background to the story are at the bottom of this post). This is the last year I am eligible for the Sir Julius Vogel New Talent award (for authors in their first 4 years after initial publication.) If you like my work, feel free to nominate me for New Talent too. Just fill out the form and tell them, in a few sentences, what you like about my stories and books. You can nominate any science fiction, fantasy or horror work published in New Zealand 2016, including films. Anyone can nominate worldwide. Voting for the shortlisted entries takes place at Lexicon, the National Science Fiction and Fantasy convention in Taupo in June, by members of SFFANZ or Lexicon. Guidelines are here. Publisher: Paper Road Press, 2016. At the Edge anthology. Just in case you’re wondering where this dark story came from, the background for Call of the Sea is here. I woke up to a text at 6:25am this morning from my diligent publisher! It was worth hopping out of bed for! Mystic Portal is #5 and Dragons’ Realm is #8 on the Amazon bestseller list in UK kids interactive fiction. And Mystic Portal is #1 in hot new releases. Exciting stuff. But then again, so are these You Say Which Way adventures, where you get to choose how the story goes. Kids love saying which way to go. They choose their story. They find out how clever they are when things go their way. Or they test dangerous decisions that lead to tricky outcomes – all from the safety of their own homes. Fun. Adventure. Great mountain bike rides. Weird creatures. And good laughs. Mystic Portal and Dragons Realm are on Amazon.